This is such a simple, easy and extremely healthy recipe. It is also a neat chemistry demonstration! 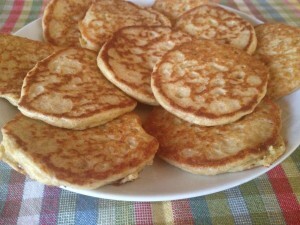 The sour dough (acid) and the bicarbonate of soda (base) react and produce bubbles, which make the pancakes light and fluffy. Mix the oats and kefir together in a glass container. Cover and leave on the kitchen counter for 24 hours. 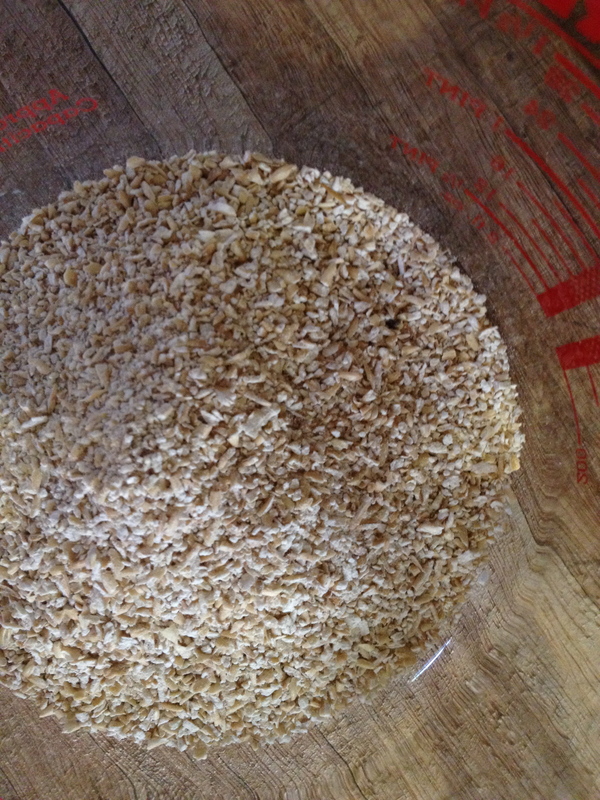 Mixture of Oats and Kefir, ready to be covered and fermented. Spray a big pan with non-stick spray. Heat 2 Tablespoons of organic Coconut Oil until hot. 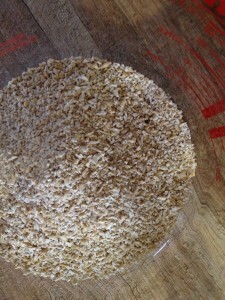 In the meantime, add the egg, salt and baking soda to the soaked oats and mix thoroughly. Bubbles will start to break through almost immediately. Flip over as soon as edges start to appear ‘dry’ or cooked. Cook for a minute on other side. Remove from pan and serve with eggs for a balanced breakfast. We also enjoy this with a small glass of kefir (with small amount of ground flax seeds and some maple syrup). It also tastes great cooled down. Note: You might need to increase or decrease the amount of oats by a teaspoon or so, depending on the type of oats you are using. 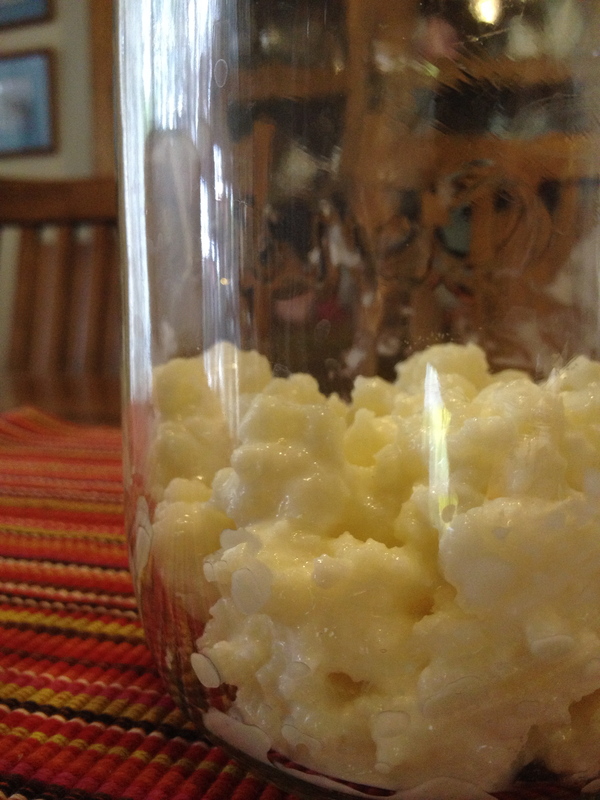 Kefir is a popular fermented milk with many health benefits. The milk is cultured with kefir ‘grains’. 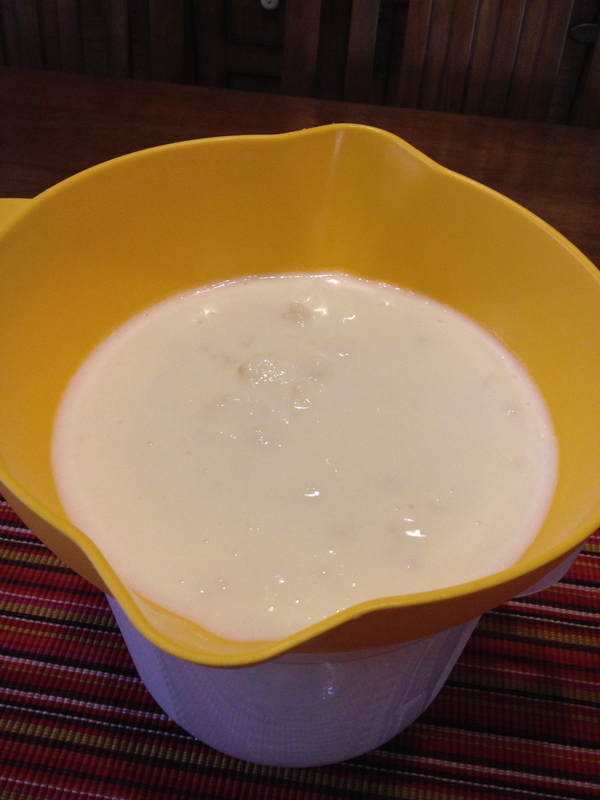 It has a refreshing sour taste and can be compared to a drinking yoghurt, but it is easier to make than yoghurt, and also healthier. Kefir contains many beneficial bacteria and yeast, which colonize the gut with good bacteria. This will boost the body’s immune system. It is also very easy to digest – babies love it. 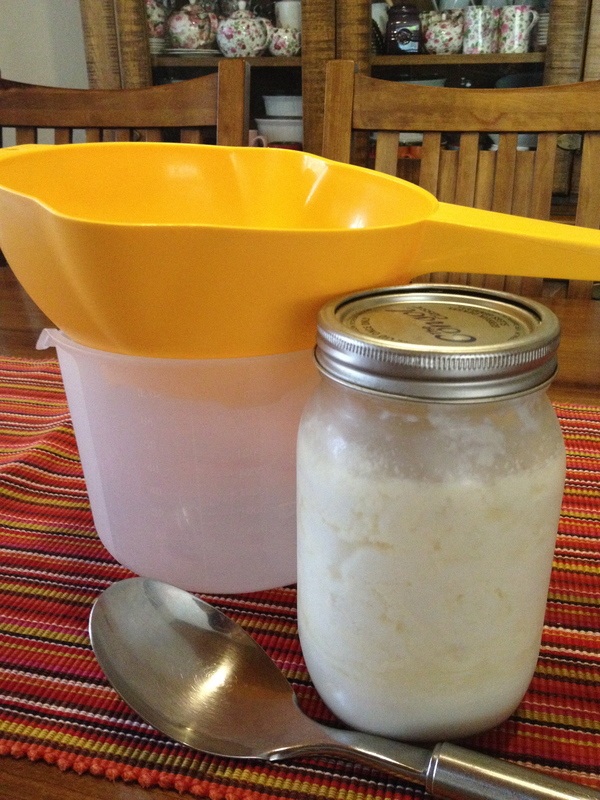 Place ¼ -1 cup of kefir ‘grains’ into a clean quart (1 liter) canning jar. Add milk until ¾ full. We prefer good quality raw milk, but you can also use hormone-free pasteurized full cream milk. Never use Ultra Pasteurized milk for anything. Cover with lid, but don’t screw it on tightly. You could also use a paper towel or cloth napkin to cover it with, and then secure it with a rubber band. It should be able to ’breathe’. Leave it on the kitchen counter for about 8–36 hours. It takes longer to ferment in winter, and shorter in summer. You can gently shake it a few times during this time. 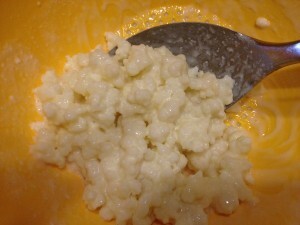 The consistency becomes thicker and the whey and cheese parts may even begin to separate. The shorter the fermentation, the milder the taste. The longer the fermentation, the more sour the taste. You could put the whole bottle in the fridge, where it will thicken even more. It will continue to ferment, but at a very slow rate. OR: you could directly go to Step 4. Screw the lid on tightly and shake everything well. Pour the kefir through a plastic strainer to remove the kefir ‘grains’ from the drinking kefir. Put the kefir ’grains’ in a clean glass jar and start all over again. There is no need to rinse the grains with water. 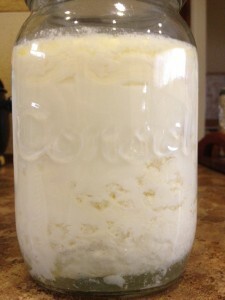 You will notice that your kefir ‘grains’ will increase with time. You can give some away if it becomes too much or ferment an extra bottle of kefir or compost it. 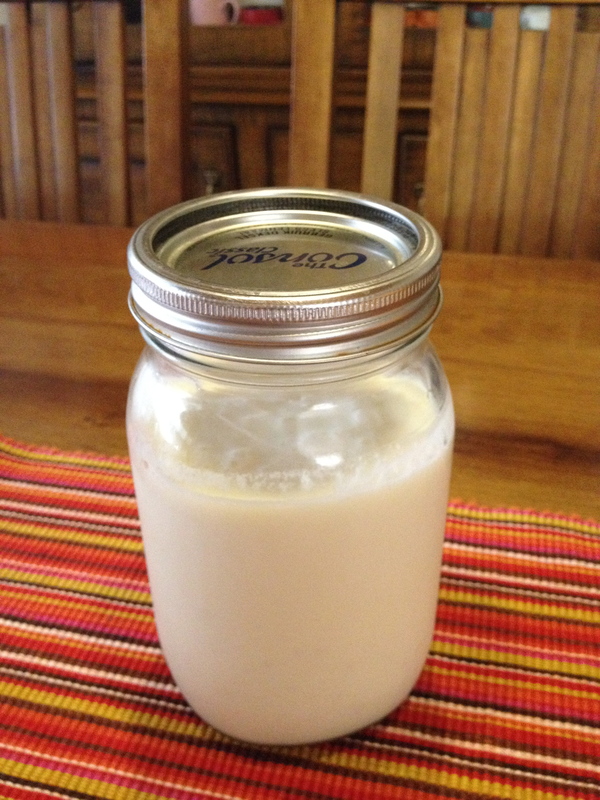 The drinking kefir is now ready to be used. This is the part that collected in the bottom container. It stays good for a long time, but will become very sour after a week or two or three. Our chickens absolutely love our too-sour kefir! It keeps them healthy too. 3) Mix 1 tsp – 1 Tbsp (5ml – 15ml) of organic ground flaxseed and little bit of real organic maple syrup in. This is truly a potent Super Food drink. (Warning: start with very small amount of flax and slowly work your way up to a greater amount). I use a coffee mill to grind flaxseeds and store it in the fridge in an airtight container. 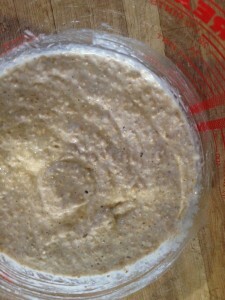 4) Use it to soak whole grain flour for baking muffins, crackers and breads. 5) It can also be separated into whey and fresh cheese by pouring it through a strainer, lined with a milk filter and refrigerated overnight. 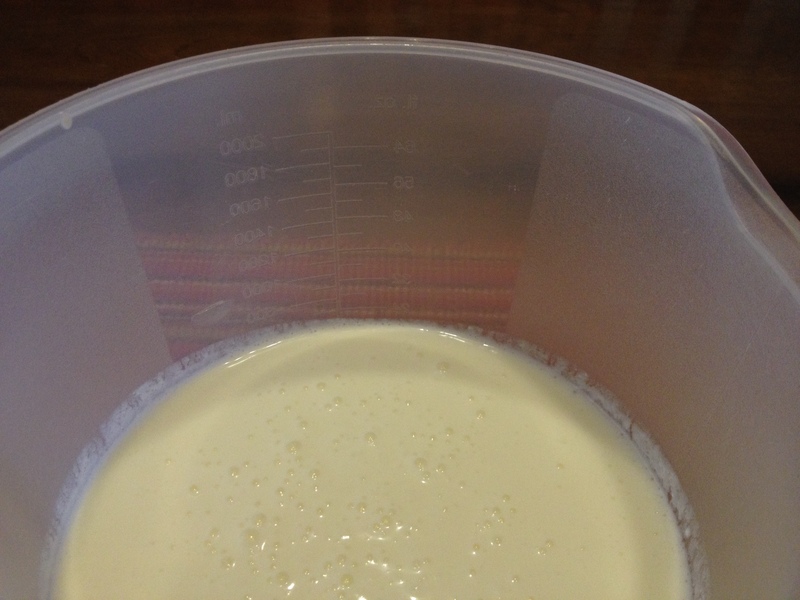 Whey will collect in the bottom container and cheese will remain behind. Both products could be used in recipes. ¼ cup (60ml) organic sesame seeds – toasted in a dry pan, over low heat. ½ cup (120ml) good quality butter, melted. Mix flour and kefir well. Make sure there is no dry flour left. Place in a glass container and cover. Leave for 24 hours on counter. Place the soaked flour, salt, bicarbonate of soda and ¼ cup (60ml) butter in a food processor and process until well blended. Add the seeds and pulse a few times to blend. Roll out half of the dough at a time, on a floured surface, to about 1 -1 ½ mm thickness. Cut into 3cm strips, and then into 5cm lengths. Use a fork to make 3 rows of indentations on top of each cracker. 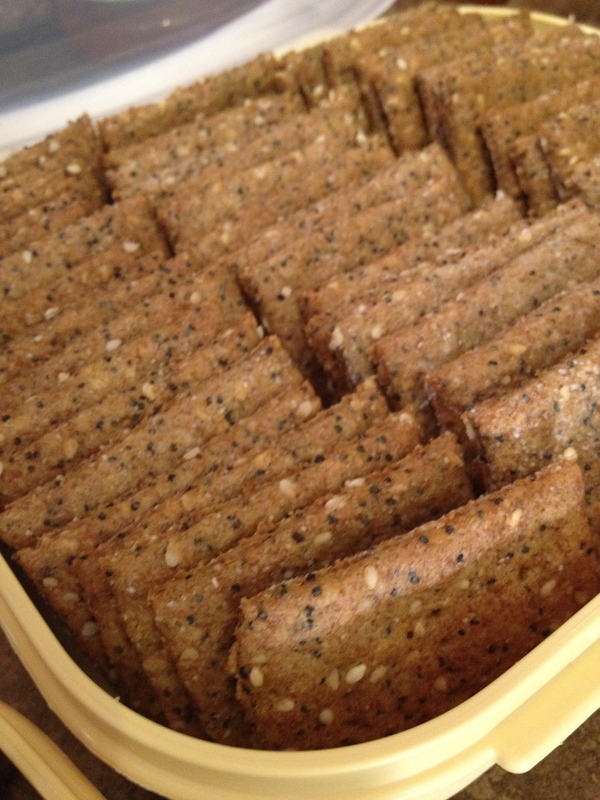 Place crackers on a greased baking sheet. Brush crackers with the remaining melted butter. Bake for about 12-15 minutes until crispy and lightly browned.